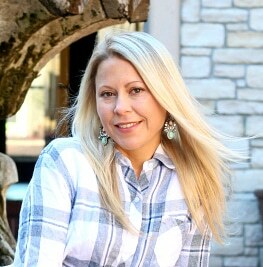 Ummmm… I think I have a new favorite recipe here at Kim’s Cravings. 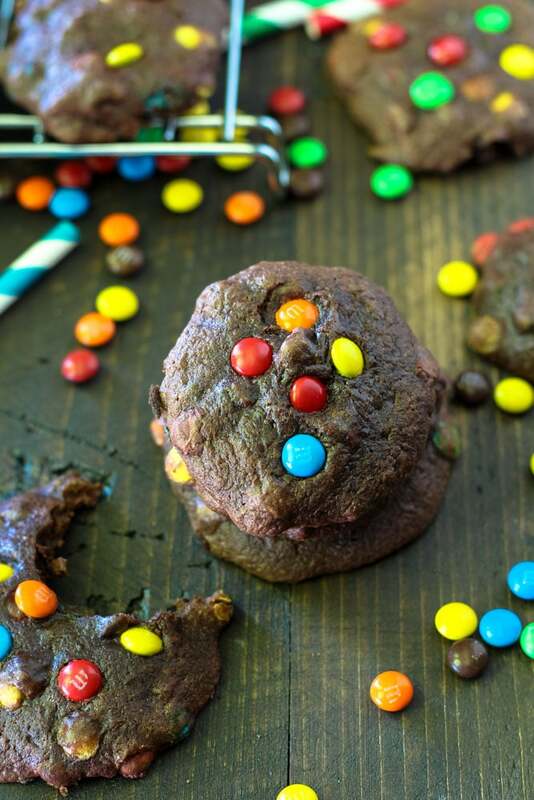 No joke- these Gluten Free M&M Brownie Cookies are soft, chewy, fudgy and just absolutely amazingly delicious. And guess what. 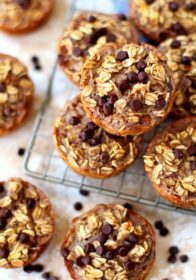 These cookies are not only gluten free chocolate heaven, but they’re also one of the simplest recipes on the blog. How and why people would make cookies with brownie mix was a mystery to me, but then I did it and now I’m a complete believer. For these cookies that take less than 20 minutes, I’ll do it and I’ll be happy about it. And you’ll be really happy about it too. 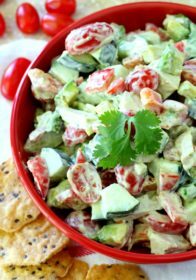 When I made them for a family cook-out, last weekend, they were met with rave reviews. There wasn’t a single brownie cookie left at the end of the day. The most chocolatey scrumptious brownie mix, from Pillsbury gluten free product line, helped to make these cookies super special. 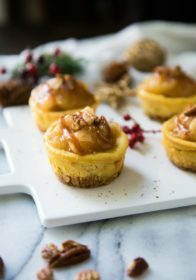 They were simply irresistible and there were no worries about serving them to my gluten free friends and family. 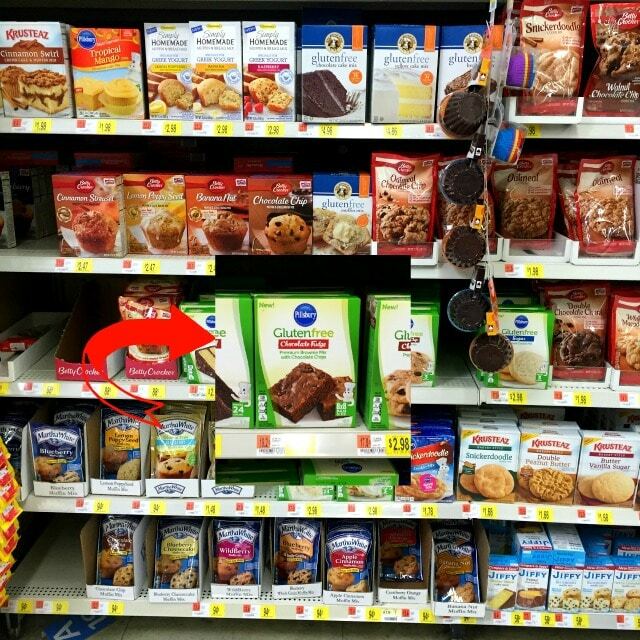 I came across the Pillsbury Gluten Free Premium Chocolate Brownie Mix while perusing the baking aisle at Walmart. I also stocked up on a few other Pillsbury gluten free products… do you guys remember how I fell in love with the Pillsbury Gluten Free Funfetti Cake Mix? It can really make life easier when you have yummy sweet treats ready to go at a moment’s notice. You never know when you’re going to be expected to bake something up. 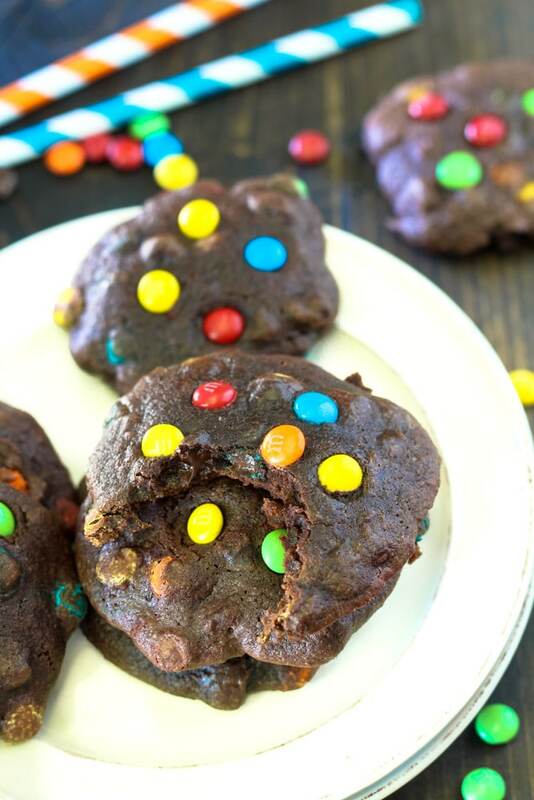 Because Pillsbury adds chocolate chips right straight into the brownie mix, these Gluten Free M&M Brownie Cookies are bursting with intense chocolate flavor and have that chewy, ooey, gooey texture we all crave in a cookie. The ultimate way to satisfy a serious chocolate craving. 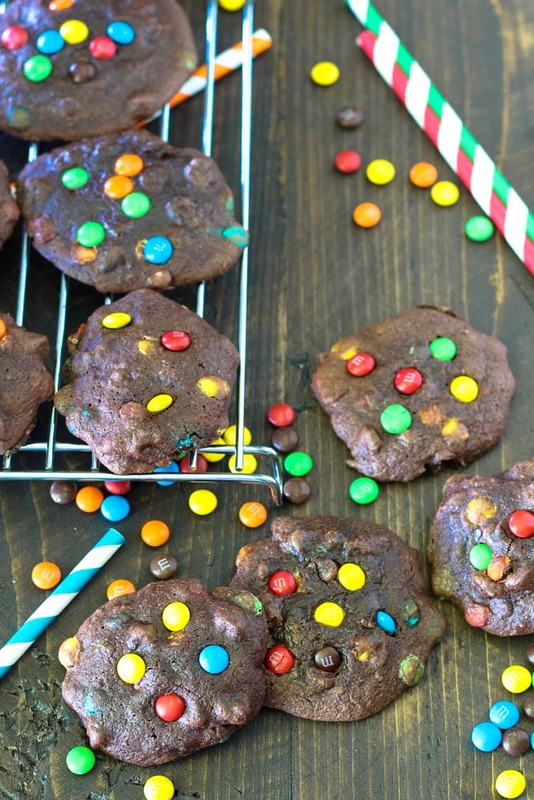 With the added M&Ms, this cookie is loaded with triple chocolate goodness. My go-to chocolate sweet treat from now on. 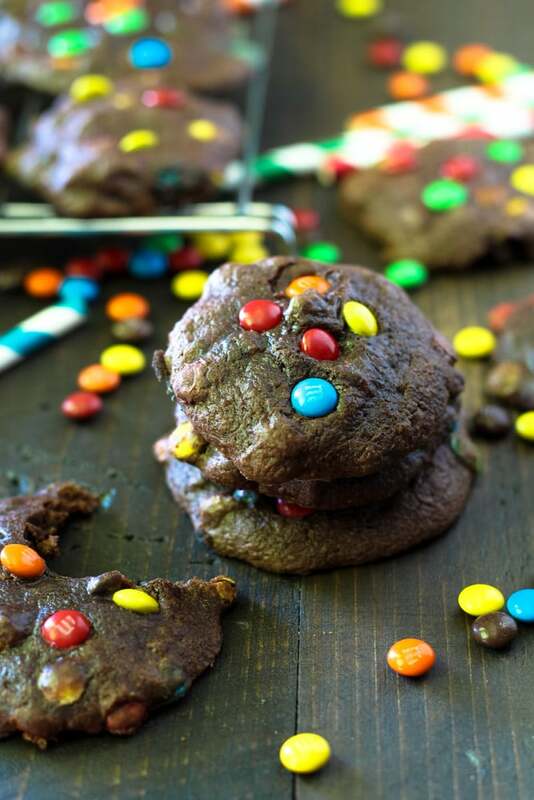 Nope… I don’t need another chocolate cookie recipe! And I don’t think my family would disagree. And pretty much a chocolate lover’s utopia! 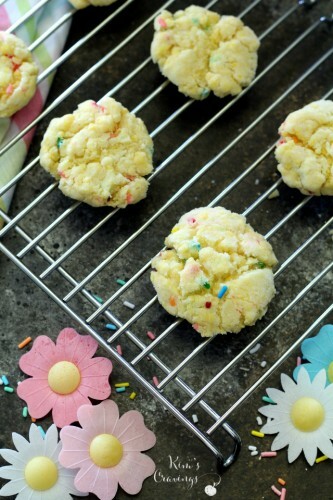 Enough with the babbling, now get in your kitchen and whip these cookies up! 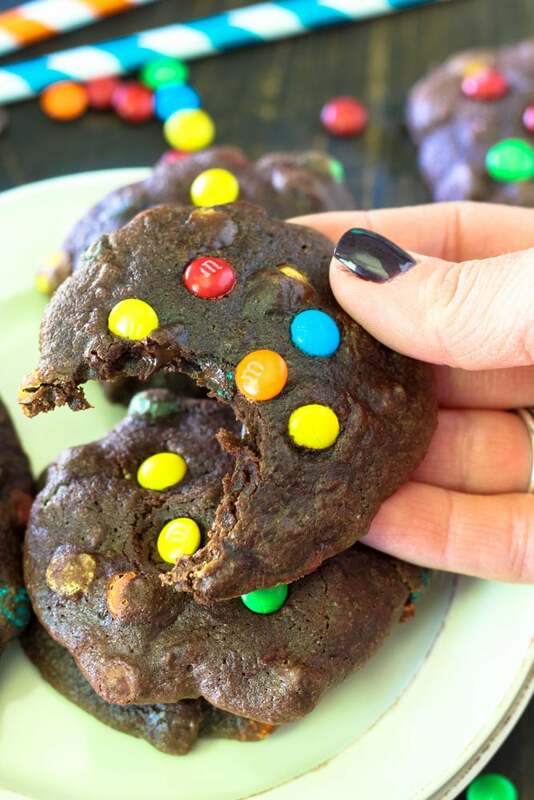 These Gluten Free M&M Brownie Cookies couldn't be easier and they're soft, chewy, fudgy and just absolutely amazingly delicious. In a medium mixing bowl, stir together dry brownie mix with eggs, applesauce and flour. Fold in mini M&Ms. Scoop two tablespoons of dough at a time into mounds on an ungreased cookie sheet and keep dough about 2 inches apart. I used a cookie sheet lined with nonstick baking foil. 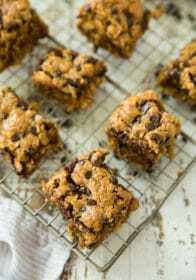 A cookie sheet lined with parchment paper or a baking mat also work well. Bake for 9 minutes. To give cookies a super festive look, about halfway through baking remove cookies from oven and top each cookie with a few extra mini M&Ms. Store cookies in an airtight container. If cookies last more than a few days, I suggest storing them in the fridge or freezer. 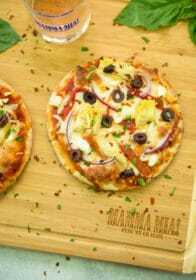 *If avoiding gluten is not an issue, any flour (all-purpose, whole wheat, spelt) can be used. **Not all M&M varieties are gluten free. The miniature M&Ms from Mars brand are gluten free. 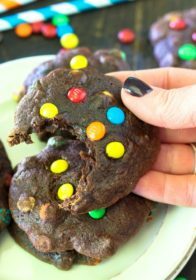 If you’re a fan of these Gluten Free Brownie M&M Cookies, you’re sure to love my Gluten Free 3 Ingredient Funfetti Cookies! 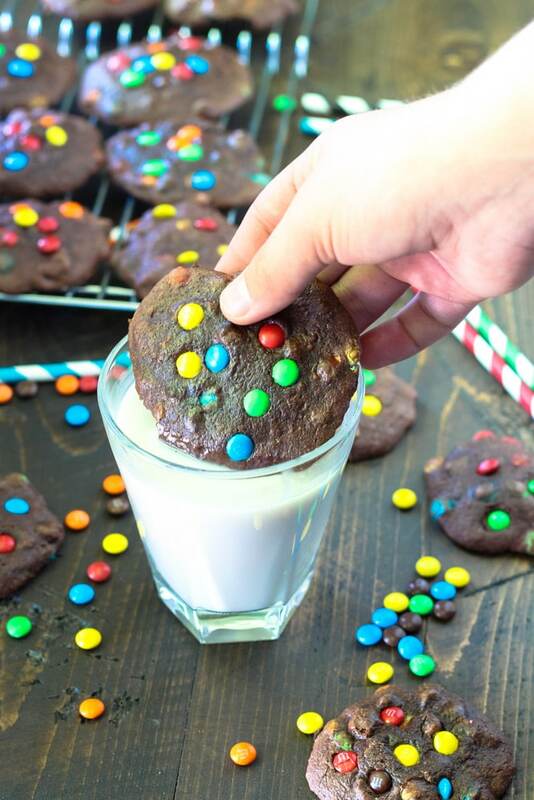 Have you ever tried using a brownie mix to make cookies? 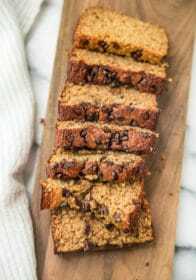 Next time you’re baking up something sweet, you definitely need to give this easy recipe a try! Save on Pillsbury products with this coupon. 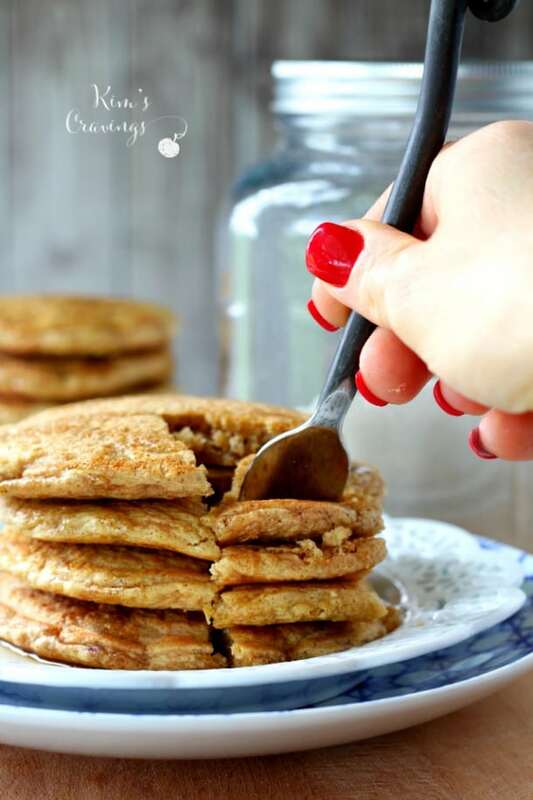 Get additional recipe ideas by visiting Pillsbury on Pinterest.